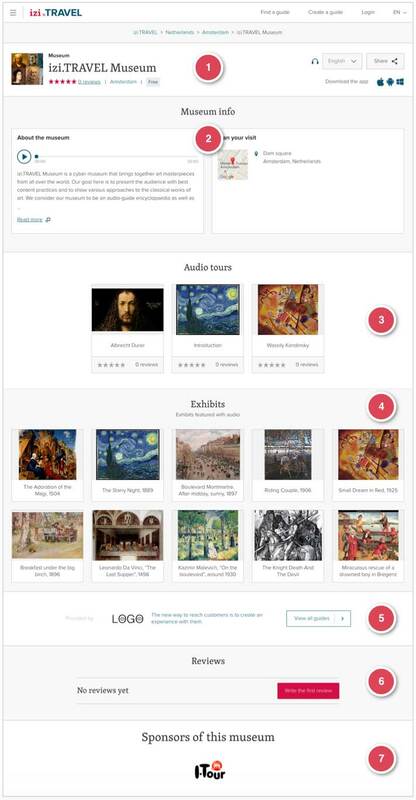 The museum audio guide you created can be viewed not only in the mobile app but also on the izi.TRAVEL site. This is why you need to check the audio guide prior to publishing it not only in the mobile app but also on the website. In order to see how the created audio guide will look on the izi.TRAVEL site, press the “Preview” button on the museum panel. A new browser tab will open with your museum’s page on the izi.TRAVEL site. The museum’s image and name. Its audio story, description, and coordinates. Museum collections. If no collections have been created, this unit will not be shown. Reviews. This unit does not contain any information prior to publishing; however, in the future, you will be able to see the comments of people who have listened to the audio guide. Information about the museum sponsors. This unit will be shown if you have specified a sponsor in the corresponding section under museum properties. Check if all the information is correct, and make changes in the izi.TRAVEL CMS if needed. Important! If you have found your museum on the izi.TRAVEL site and have not seen the most recent changes, wait 15-20 minutes, and try again.